featuring: Sabrina Mandell, Elena Day, Mark Lohr, Nicolo Whimsey, Ukecordionpacolypse, Graham Pilato, along with Rich Potter and Karen Beriss. 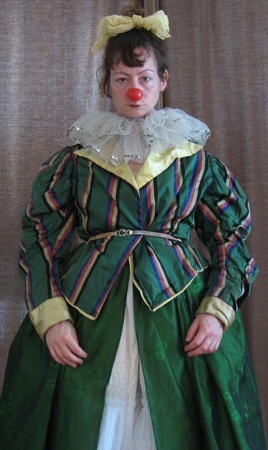 Sabrina Mandell is the Co-Artistic Director of Happenstance Theater and since 2006 has written, produced, performed in and toured original, critically acclaimed devised works of Theatre including the Clown Theatre piece LOOK OUT BELOW! and the DaDA Clown piece MANIFESTO! (which will be remounted as part of the 2011 Capital Fringe Festival) She also performs regularly with the Big Apple Circus’ Clown Care Program at the Children’s National Medical Center and Johns Hopkins University Hospital. Elena Day is a lover of thought, color and movement. She started Oberlin College’s first comedy improv group, was rebuked by the great Jacques Lecoq, and developed a real cute character for Cirque du Soleil. She's currently clowning in Cirque Mechanics’ “Boom Town”. In her spare time, she analyzes how people walk. Nicolo Whimsey is celebrating 25 years of merry performances in 2011. 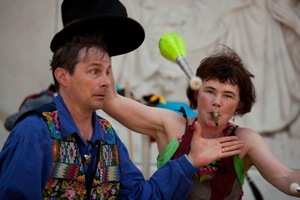 Nick Newlin and Joanne Flynn began their epic adventure of juggling, music, music, poetry, pantomime, character-acting and audience participation on the streets of Europe in 1986, and spent the rest of the decade traveling to Renaissance Fairs, performing a spectacle that included a performing pig named Venus. In the 1990’s, Nick obtained an M.A. 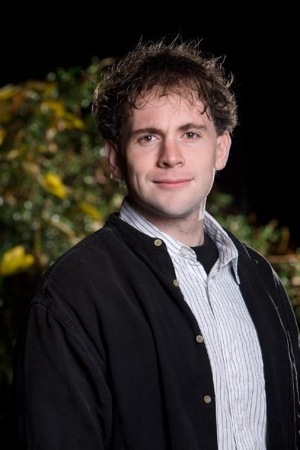 in Theatre from the U of MD, and since 1996 he has spent three months out of each year as a Teaching Artist with the Folger Shakespeare Library, leading to his recent book series The 30-Minute Shakespeare. He also plays keyboards and accordion in the rock band Hot For Teacher. In addition to her whimsical jestering, Joanne has developed a passion for preserving rural spaces, and was recently awarded the Aileen Huges Award for leadership in land conservation from the Maryland Environmental Trust. The Uke and the Accordion, together again to rediscover why they broke up in the first place! 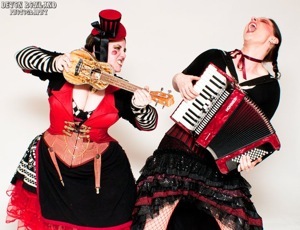 The semi-sober stylings of Mab, Just Mab & Madame Baska D'Joy, DC's first, only, and last uke and accordion duo has blazed onto the DC scene, entertaining, confounding, and astounding crowds with their music. Ukecordionpacolypse is on a mission to melt your face off with the power of ROCK! Brought together by fate, held together by duct tape, and fueled by tasty adult beverages, these two talented dames are ready to rock steady.